A native of the Pacific Northwest, Dave Peck is recognized as an outstanding composer, arranger and pianist. He is known for his introspective style and rich harmonic coloring and has been described as “…a formidable musical voice, lyrical and insightful” and “…an absolute artist with a unique command of his instrument and the language of music”. Downbeat magazine says Peck’s playing is “lyrical and pastel, swinging and bluesy, with a ringing crystalline touch.” and Cadence Magazine says he “…can hang with the currently feted crop of young lions”. Dave has appeared on Piano Jazz with Marian McPartland. Ms. McPartland said “Dave Peck is a pianist and composer who possesses great musicality, a sensitive touch and a lively sense of swing.” His performances and compositions have been heard on Jazz After Hours, National Public Radio's Jazz Alive, Jazz Journal, New Jazz Northwest, and Northwest Jazz on KPLU FM as well as VH1 and Canadian Broadcast Television. His music is featured internationally on terrestrial, satellite and internet jazz radio. From 1978 through 1996 Dave performed as a sideman, most notably, as pianist and composer for legendary saxophonist Bud Shank. Their collaboration from 1985-2000 led to the CD, Tales of the Pilot, Bud Shank plays the music of David Peck, released on Capri Records. Dave's compositions for Shank can also be heard on the Contemporary/Fantasy label on both Live at Jazz Alley and Tomorrow's Rainbow. And as pianist with Shank he can be heard on Live at Jazz Alley and The Lost Cathedral. Also during this time he appeared with many great musicians including Chet Baker, Joe Williams, Sonny Stitt, Lee Konitz, Art Farmer and Clifford Jordan, Harry "Sweets" Edison and Eddie "Lockjaw" Davis, Howard Roberts, Ernestine Anderson, Gary Peacock, Pete Christleib, Bob Cooper, Bill Perkins, John Clayton and Jeff Hamilton, Freddie Hubbard, and Claudio Roditi. His arranging and composition credits include grants from Meet the Composer and commissions for Bud Shank, Marco Silva, Syzygy, Composers and Improvisers Orchestra, Ernestine Anderson and Diane Schuur. 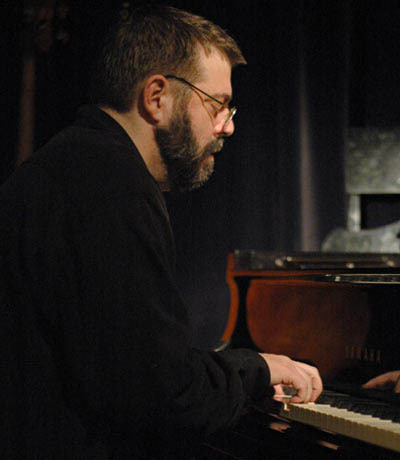 Formerly an Associate Professor of Music at Cornish College of the Arts in Seattle Dave currently maintains a private teaching studio where he teaches Jazz Composition, Repertoire, Improvisation and Piano.